With Halloween approaching, we thought it would be fun to pick up a Halloween costume for Storm. She seems to do a lot better with wearing thing than Dakota did. Which is kind of odd. Dakota wasn’t a chewer, meaning she did not eat or chew on anything that wasn’t her food, or a treat we have her. She wanted nothing to do with chew toys in her latter years. Storm is a different beast. She will wait until Wendy is folding laundry, and then play “I’ve got a sock… come chase me”. … and last Christmas, we put a Santa Claus hat on her, and she didn’t try to take either of them off. Off to the Pet Store! Rachel and Lauren had a PD Day in early October, on the Friday of Thanksgiving weekend. We decided to take Storm to the pet store to help select a Halloween costume. As we walked in to the pet store, Storm spotted the chew toys. They had lots of new Halloween coloured chew toys that Storm had a blast looking through. Storm had a lot of fun saying hello to the other people and dogs in the store. She sniffed all of the costumes, and tugged on a few. She seemed to really like the coffee cup. Lauren would take one off of the rack, and give Storm a closer look. Rachel even lifted Storm up so she could see the costumes on the top rack. Crisp and clean, with no caffeine! Storm sniffed through so many costumes. In the end, Storm ended up liking the coffee cup costume the best. 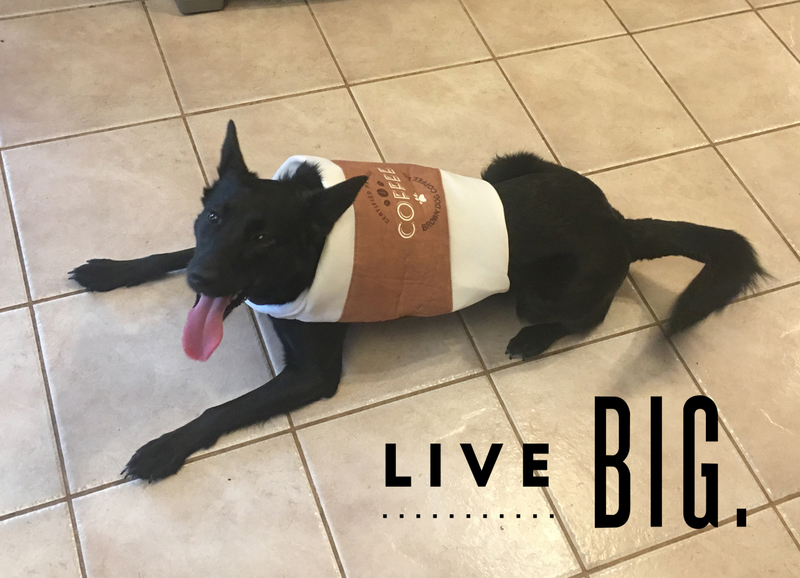 Black dog, wearing a brown coffee cup costume. We’ll have to call her “Black Coffee” for the night! Well we know where Storm’s love of coffee comes from… right Wendy? We all had a blast helping Storm pick out her Halloween costume. Do you dress your dog up for Halloween, or for any other occasion?